Add colour to your walls with this quirky surreal and minimalist art collage! A one-off only canvas collage featuring a restaurant waiter (of the non-human specie) holding a green matchstick, standing by a lamp post, and let's assume it's a Greek restaurant called "Dionysus", serving steak and grog. The sign is in fact a packet of green/black souvenier matches. 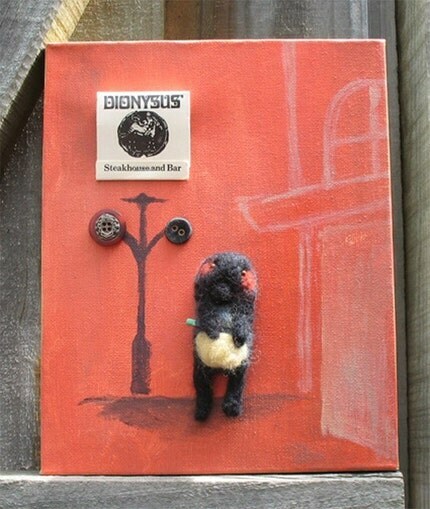 The character is needle felted. Canvas size: 20x25x3.5cm with a drawer knob stuck to the bottom.